Every so often we come across a recipe that makes it into our rotation on a semi-regular basis. And even less often than that, it’s a meal that can be prepped in large batches and well ahead of time and then frozen. 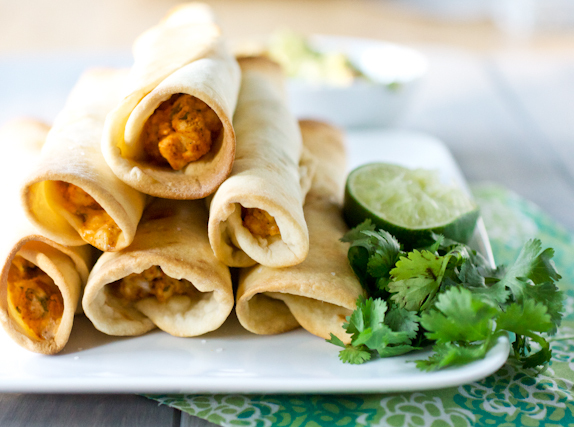 These baked creamy chicken taquitos will be your best friends. I first started making them well over a year ago and one of the things I love most about them is that they are the kind of meal that you can throw almost anything into. Black beans? Sure! Leftover roast or grilled chicken? Definitely! Avocado? Why not! A lonely unused half of a jalapeño or poblano pepper? Spice it up! Nubs of various leftover cheeses that have almost no use for anything else? Cheese is always welcome! Served with a side of refried or black beans, these taquitos are are truly a favorite around here and I certainly can’t ask for a more versatile and quick meal, especially for a weeknight. And it’s even better when all I have to do is pull a few ready-made ones from the freezer to pop in the oven! Oh, and I also think they would make a spectacular appetizer or snack if you use smaller tortillas or even cut out rounds with a cookie or biscuit cutter from larger (burrito-size) tortillas. Game day anyone? I tend to make a double recipe when I make these taquitos and freeze whatever we don’t plan on eating for dinner that night. You’ll just freeze the uncooked taquitos on a parchment-lined baking sheet until completely frozen (don’t let them touch or they will freeze together) and then transfer them to a plastic zipper bag. When you’re ready to eat them, toss them directly into the oven and bake for about 25 minutes, until the filling starts to ooze out the ends. Preheat the oven to 425? F. Line a baking sheet with a silicone mat or parchment paper. In a large mixing bowl, combine the softened cream cheese, ¼ cup salsa, lime juice, spices, garlic, cilantro, green onions or chives, chicken, and shredded cheese. Mix everything together until well combined and the cream cheese is evenly distributed throughout the mixture. If the filling seems too dry, add a few extra tablespoons of salsa until it loosens up a little. Sandwiched between two damp paper towels, briefly heat the tortillas in the microwave to make them soft enough to roll easily, about 20-30 seconds. Place a warmed tortilla on a work surface, keeping the other tortillas covered by the paper towels to avoid drying out. Using a medium-size cookie scoop, line the middle of the tortilla with a heaping scoop (about 2-3 tablespoons) of the filling mixture. Roll the tortilla up tightly around the filling and place it seam-side down on the baking sheet. 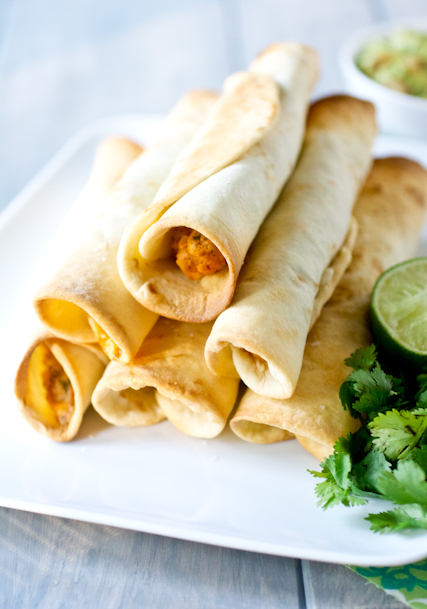 Repeat with the remaining tortillas and filling, spacing the assembled taquitos evenly on the baking sheet. Spray the tops lightly with cooking spray and sprinkle a very small pinch of kosher salt onto each taquito – don’t skip this as the salt finishes off the taquitos. Bake 15-20 minutes, until crisp and golden brown. Serve with sour cream and salsa, if desired. Preheat the oven to 425° F. Line a baking sheet with a silicone mat or parchment paper. Note: I tend to make a double recipe when I make these taquitos and freeze whatever we don’t plan on eating for dinner that night. You’ll just freeze the uncooked taquitos on a parchment-lined baking sheet until completely frozen (don’t let them touch or they will freeze together) and then transfer them to a plastic zipper bag. When you’re ready to eat them, bake directly from the freezer for about 25 minutes, until the filling starts to ooze out the ends. I’ve got a recipe for baked flautas/taquitos posted on my site, but it doesn’t call for cream cheese. I love the idea of a creamy filling and plan to try these soon. I also like your suggestion of making a double batch and freezing them for an easy work night meal. Now that my husband and I are empty nesters, there may actually be a few left over to freeze! I have never made this either but now I want them! always love a dish that is versatile. Love your pictures, btw! I made this for dinner tonight–my husband and I loved them! Its nice to find a cook and her recipes that are adaptable and still REALLY good. PS- I had a leftover yellow bell pepper and a bit of sweet onion needing to be used. I also added a bit of crushed tomato in addition to the salsa. Thanks for the license to toss these into the mix! PPS- you’re right, the kosher salt isn’t optional-it makes it.